For troubleshooting purposes, you may sometimes need to check your site’s error logs and access logs to get more information as to why a problem may occur. 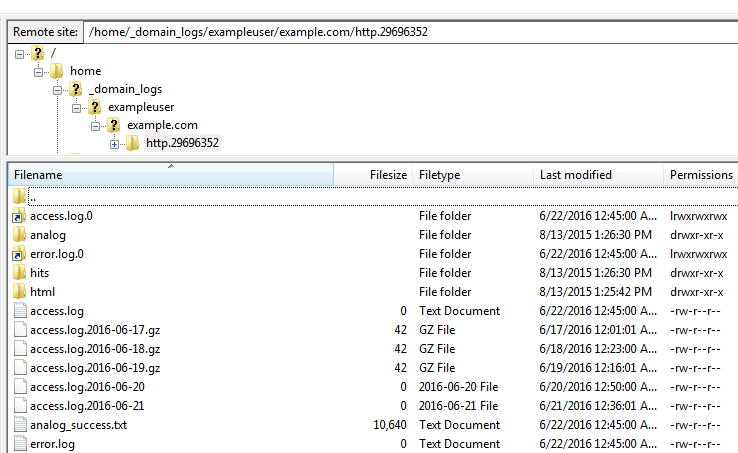 This article explains how to view these logs using SFTP. As mentioned previously, the logs are inside the /logs/example.com/http directory under your username on the server. Make sure your user is an SFTP or Shell user. Visit the Enabling Shell Access article for instructions. Log into your server using your client. Visit the FTP article for details. Click into the /logs directory. Click into the appropriate site from this next directory. Click into the http or https directory depending on which logs you'd like to view. Your 'http' or 'https' directory may have a random string of numbers after it, or you may see several directories. Just look at the date to the right to choose the most recent directory. You’ll see the error.log and access.log as of today. Once in the /http directory, you'll notice that your remote site looks different at the top, which shows that your selected directories have changed – this is fine. Right click on the log file and open with your text editing program.